This is an exciting time of year for our Student Leadership Council (SLC)! 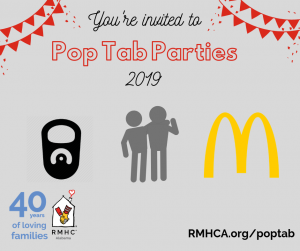 The new members have officially been announced, most have started school and they are already hard at work representing Ronald McDonald House Charities of Alabama. 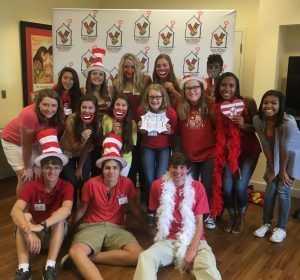 On Saturday, August 20th, the new group of Student Leadership Council members hosted their annual Open House at RMHCA. The newly appointed council, consisting of high school juniors and seniors in the Birmingham area arrived early to ensure everything was set and ready when the first visitors arrived! They decorated the outside of the House with balloons and sidewalk chalk drawings and set up informational tables inside for visitors to drop in and learn more about how we’re keeping families close. They led visitors on tours of the House and educated them on things like our pop tab program, volunteering, upcoming events and more. Our friends from the Birmingham Barons stopped by with Babe Ruff and three players, Matt Cooper, Jordan Guerrero and Nick Michalczewski to learn more about what we do, mingle with our guests, sign autographs and take pictures. The SLC, guest families and visitors alike thoroughly enjoyed this special visit with some of our very own hometown celebrities.Lemonade was available for guests to enjoy and everyone was encouraged to grab a prop and pose in the photo booth before they left! Not only did the SLC get to share their knowledge and passion for the House with others at the Open House, but they also got to get to know one another better, which we believe ensures that they will have a successful year as ambassadors for our mission! Lemonade was available for guests to enjoy and everyone was encouraged to grab a prop and pose in the photo booth before they left! Not only did the SLC get to share their knowledge and passion for the House with others at the Open House, but they also got to get to know one another better, which we believe ensures that they will have a successful year as ambassadors for our mission!